Adavi specializes in Rental Mobile Speakers in Ho Chi Minh City, Adavi's bluetooth speaker rental service gives you peace of mind when using with the most optimal cost. Adavi is one of the leading reputable units to provide rental services for mobile scissors candy in HCMC. Adavi rented mobile speakers with brands: Sony, JBL, Acnos, Ronamax, Beatbox, Sunrise, Temeisheng. Two speakers can connect wirelessly via Bluetooth or Jack 3.5mm with phone, Laptop, iPad. You hire speaker to play music to open, participate in exhibitions, talking, teach, introduce products, karaoke, sports festival, party, picnic, team building, birthday celebrations, party all the new year, workshop,.. Please book a mobile speaker rental as soon as possible to facilitate the delivery of the service, as well as ensure the best service is provided. - Pull speaker, charging speaker, 2 wireless mic, and 4 spare batteries for mic. The rental speaker is fully charged, in good condition. - Free delivery to take place at Tphcm. - Just in time: assigning the right type and number of speakers to hire, delivered at the right time, to the right address, delivered to the right recipient. 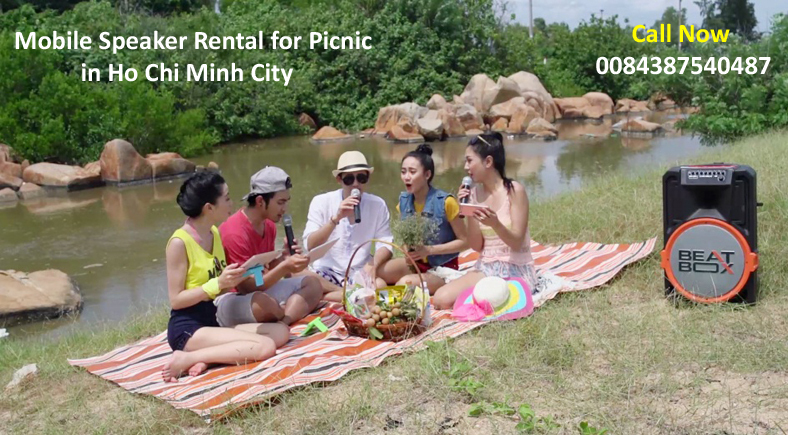 - Adavi rental of portable karaoke speakers districts in Saigon: District 1, District 2, District 3, District 4, District 5, District 6, District 7, District 8, District 9, District 10, District 11, District 12 , q Binh Thanh, Thu Duc, Phu Nhuan, Go Vap, Tan Binh, Tan Phu, Binh Tan. - Mobile Speaker with a capacity of 450W - 3 inches: 250,000 VND / piece / day. Used to play music, teach, speak, introduce products to about 30 participants, ... DO NOT use Karaoke singing. - Mobile Speaker with normal capacity of 600W - 4 inches: 350,000 VND / piece / day. Used to sing karaoke, events with a participation of about 60 people. - Mobile Speaker the Acnos Beatbox with a capacity of 600W - 4 inches: 500,000 VND / piece / day. Used to sing karaoke, events with the participation of about 60 people with high quality sound. - Mobile Speaker capacity of 1,000 W - 5 inch: 500,000 VND / piece / day. Used for events with a participation of about 100 people or more. - Step 1: Adavi receives your rental speaker demand. Adavi and you agree on the type of speaker to hire, quantity, rental price, delivery address, time of delivery and recipient. - Step 2: Adavi is ready to rent the speaker for rent and give you the speaker to hire as agreed. + When you deliver Adavi, you will check the speaker and Adavi will guide you carefully to use the speaker (if necessary). + Please deposit 01 ID card or money deposit (depending on the quantity) and pay the service fee for renting speakers. - Step 3: If you have finished using it, please contact Adavi to get back the speaker, please give your feedback to help Adavi improve service better. - Adavi is committed to leasing speakers to use quality assurance, you are satisfied. 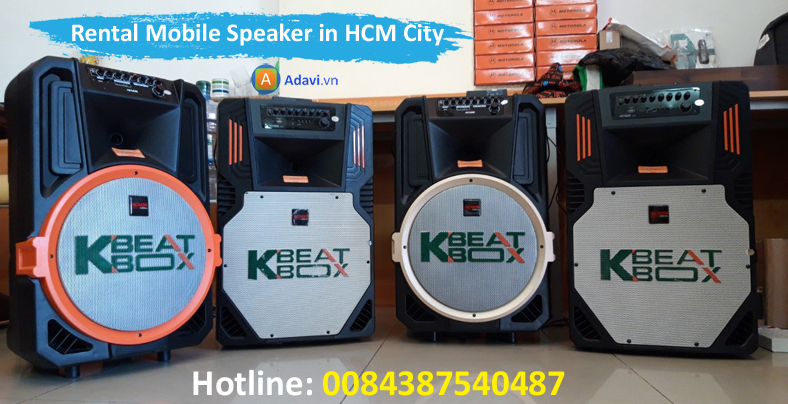 Please contact Adavi immediately via hotline: 0084387540487 for further advice or book a mobile speaker rental service in our HCMC. Or go to Adavi Co., Ltd. to check and rent Adavi speakers.